This guide is designed to increase awareness of significant issues associated with scholarly communication. It also presents resources for WSU researchers who wish to explore alternative avenues for sharing their scholarly work with a global audience. The WSU Libraries provide services to help you showcase your scholarly work online. Any member of the WSU community may share their work in Research Exchange, a digital repository that features research completed at this institution. This page presents factors to consider should you wish to place your work in the repository. Please contact us at libraries.research@wsu.edu.for more information. Citations for and/or copies of material you would like to publish in Research Exchange. The following video shows how you can deposit research on your own, but you can also get in touch with the library for assistance with any part of this process. The WSU Libraries can post for you once you've provided materials and your approval. You can post your own material. If you prefer this option, navigate to this submission form and log in using your WSU Network ID. You will be prompted to enter basic information about your submission before uploading files. Upon review, your uploads will be assigned to appropriate collections. Should you have further questions about copyright or use of the repository, check this Research Exchange FAQ or contact the WSU Libraries for assistance. If you would like to manage your own collection in Research Exchange, contact the WSU Libraries and we will provide instruction and support. However, when you publish your scholarly work, publishers often ask that you transfer all or some of these rights to them. Depending on the agreement you have made with the publisher, you may lose the ability to post work online, distribute it to students in course packs, or permit adaptations. More commonly, the publisher might restrict access to your work for a period of time or stipulate that you can only share a particular version of the work. 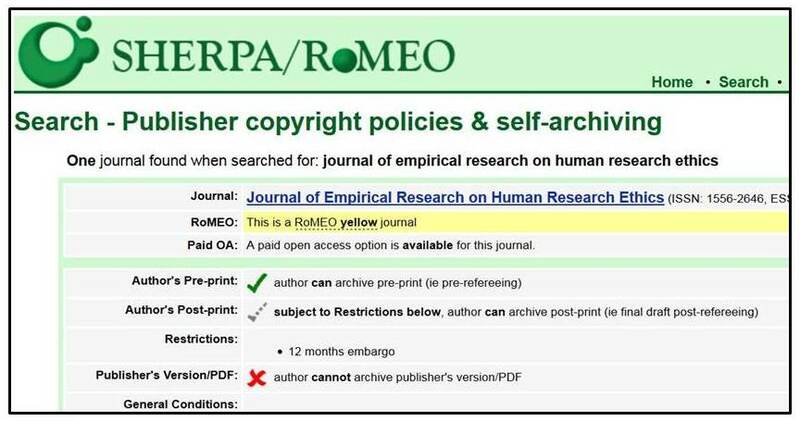 The WSU Libraries can help you determine whether work can be posted online by checking your publishing agreement, the publisher's website, or a database of publishers' policies called SHERPA/RoMEO. We can work with you to comply with publisher's requirements, so don't hesitate to contact us for assistance.